There is no doubt that fuchsias (Fuchsia) are a fabulous staple for hanging baskets with their elegant, drooping flowers hanging down like so many crystals on a fancy chandelier. But they can look fantastic in almost any container garden. They are easy(ish) to grow, and most will reward you with extravagant blooms all summer if you respect their slightly fussy requirements. Usually, fuchsias are low-growing plants that drape over the sides of containers; however, under certain conditions, some cultivars can grow to be tree-sized. Those are the varieties planted in the ground as perennials, not the bush or trailing types found in container gardens. The genus has 105 different species. Choose a 12- to-16-inch pot, depending on the size of the plant. You want a container one size larger than what it resided in at the nursery. Or, if you're combining smaller plants into one container, two or three specimen plants from 4-inch pots can live comfortably in a 10- or 12-inch pot. Susceptible to root rot, fuchsias require a fast-draining potting soil and very good drainage, so don't plant one in a pot without holes. To avoid losing dirt through large holes when you water, place some plastic screening or coffee filters over the holes before putting in the soil. Also, allow space between the top of the container and the soil line. Don't fill the pot to the rim with soil. 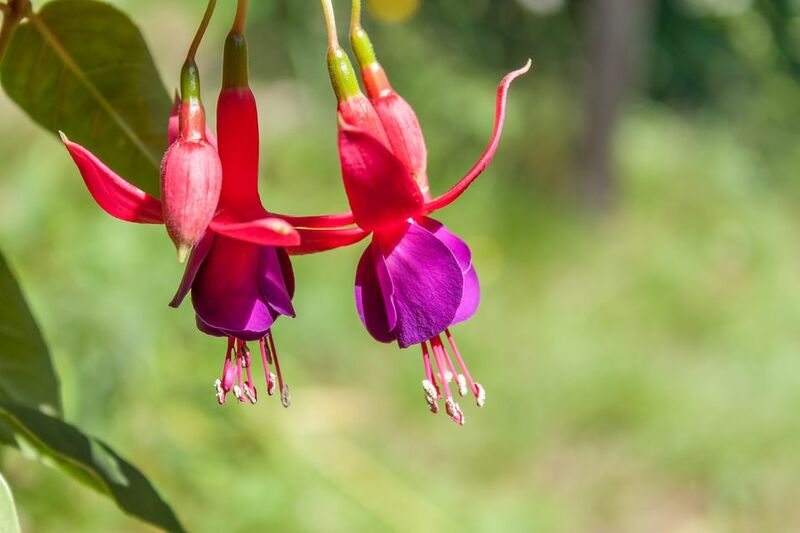 During the blooming season, fuchsias have a huge appetite, so you have to feed them regularly with diluted liquid fertilizer—many are available, and a combination of fish emulsion and seaweed can work well. Fuchsias like to be moist but not soggy. They thrive in humidity, so if you live somewhere dry, they are a little more challenging to grow and keep hydrated. Though slightly fussy about moisture and temperature, fuchsias are still considered an easy plant to grow in container gardens. Most will thrive in part shade to full shade. They don't like to be too hot, and they especially hate dry heat. Fuchsias are happiest with temperatures between 55–80 degrees Fahrenheit, though there are some heat-tolerant cultivars that will keep their blooms up to 90 degrees Fahrenheit. Fuchsias thrive in humidity, so if you live in a dry climate, you may have to mist your plants to keep them sufficiently moist. Though some fuchsias don't need deadheading, for peak bloom production, pick off any spent blossoms. Flowers appear only on new growth. Unless you live in zones 10 or 11, fuchsias are considered an annual, though some are hardy down to 25 degrees Fahrenheit. Fuchsias can be brought inside and grown as houseplants in the winter but often fail because the air is too dry and they have a susceptibility to spider mites. Fuchsias are most commonly used in hanging baskets, but they can look fabulous in most containers. There are many different cultivars, colors (red, pink, white, purple, violet, and bicolored flowers), and flower forms, but almost all are delicate looking. Fuchsias look lovely in a pot on their own but also pair well with complementary or contrasting colors. Display them with oxalis, angel wing begonias, lobelia, or coleus.